What seems like a good idea could be the ruination of your trusty outboard motor—avoid these common winter storage miscues. By Charles Plueddeman – Boats.com. You’ve read the How to Winterize a Boat guide, learned how to change the lower unit oil, the fuel has been treated, and every grease zirk has been lubed. You’ve got your outboard-powered boat winterized by the book. Now you’ll park the boat and trailer and let them sleep tight until Opening Day. But wait! If you live in a cold climate and store your outboard outdoors, things can still get screwed up—read these tips from North Woods marine techs, before the snow flies. Wrapping an outboard in plastic is asking for corrosion trouble under the cowl. My neighbor at the lake did this last year (see photo) using an old shower curtain. At least he didn’t go all the way and seal the plastic with duct tape. When you wrap an outboard in plastic you insure that any moisture that’s under the cowl, or gets under the cowl, cannot escape through the vents in the cowl provided just for that purpose. This moisture, even if it’s just condensation, can start corrosion on electrical connections and moving parts like the throttle linkage. During the course of the winter there will be cold days and warmer days, the sun may shine on your motor, and the air under the cowl will need to breath. • Bonus tip: Before laying up the motor spray down the powerhead with a water-displacer like WD-40. Then secure the cowl but don’t cover it. 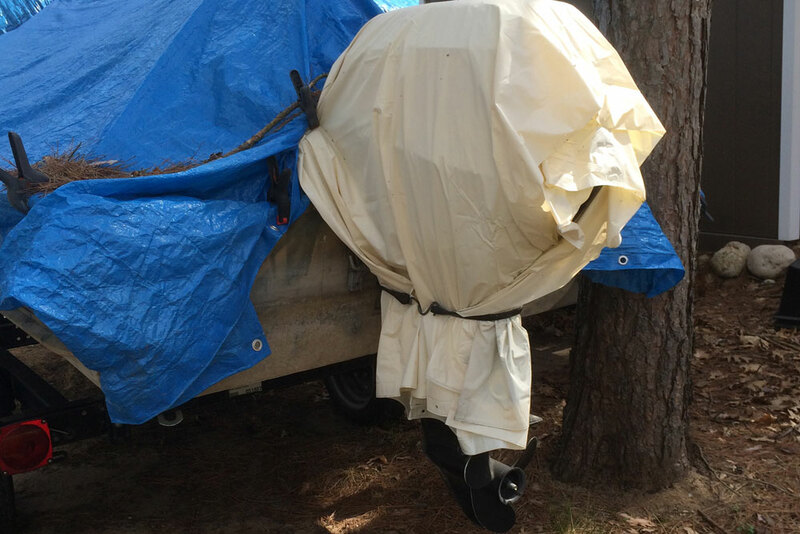 • Bonus tip: If you have your boat shrink-wrapped either don’t cover the outboard, or rig the wrap so that air can still circulate around the motor. And make sure the shrink wrap is not covering the vent of an inboard fuel tank. One of the great features of an outboard motor is that it’s self-draining. But it’s only self-draining when it’s in a vertical position. If you trailer the boat home with the motor tilted up and the forget to lower it before storage, any water left in the motor will freeze and could cause damage. Another problematic possibility is that snow or rain water can collect in the barrel of the prop and migrate down into the exhaust passages of the gear case. Eventually it gets really cold one night and… POP! Your gearcase is cracked. Of course, this couldn’t happen since you wrapped your motor in plastic and sealed it with duct tape… never mind. 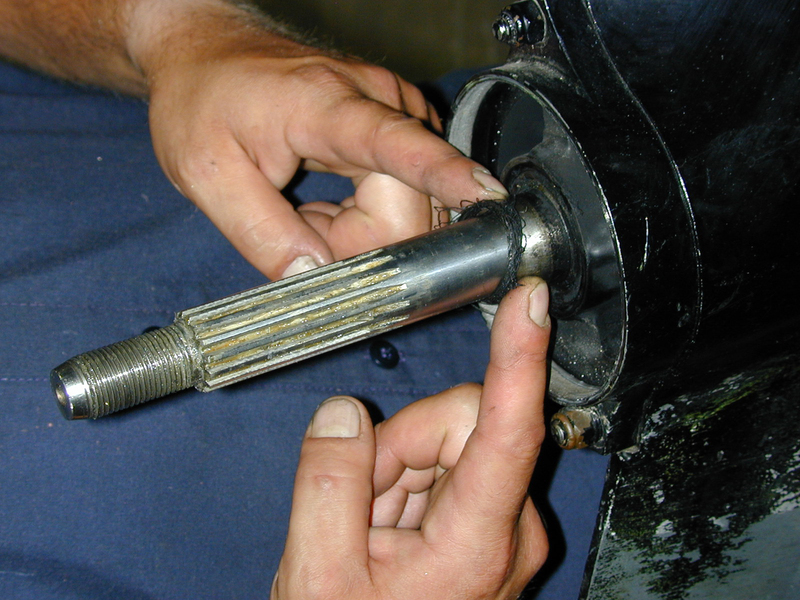 Use your finger nail or a sharp pick to check for fishing line around the shaft at the seal. It’s often embedded in grease and hard to see. If the boat is stored outdoors, you might as well put a sign next to it that says “Steal My Prop.” Besides, you’ll want to pull that prop so you can check the shaft for wrapped-up fishing line and remove it (see how to remove fishing line from a prop-shaft) before it cuts through the prop-shaft seal and lets water into your gearcase. Maybe the prop-shaft seal is already damaged. Well, now you know. Get it fixed over the winter when the shop is slow. The last step: slather that exposed shaft with some grease so it doesn’t corrode over the off-season. • Bonus tip: If you can carry your trolling or kicker motor, so can a thief. Unclamp that 9.9 and put it someplace secure. I keep mine in my office, so I can enjoy that outboardy smell all winter. I know your two-stroke sounds really cool when you start it up on the trailer, but there’s no reason to start the motor without first attaching a supply of water per the instructions in your owner’s manual. Remember–your outboard is self draining. Starting the motor to “blow out the water” even for just a few seconds can seriously degrade or destroy your water pump impeller, which relies on water for lubrication.